This week the U.S. Navy released its budget proposal for 2019 and a new 30-year shipbuilding plan. 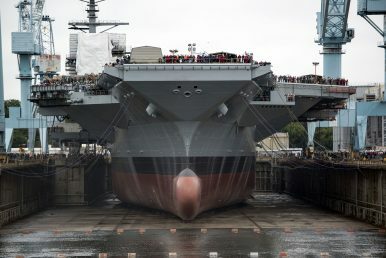 The shipbuilding plan is the Navy’s first concrete explanation of how it intends to build the substantially larger fleet it has said it needs for more than a year. The plan is realistic in that it does not expect to be able to build that fleet very fast, or even within its own three-decade horizon, and thereby does not meet the strategic requirements the Navy says it has. But the plan is also innovative by establishing a supplemental plan to accelerate the fleet’s growth if sufficient additional funding is allocated. The new plan is far more detailed than previous ones, which have sometimes been criticized by lawmakers for being “fantasy” documents. The Navy’s 355-ship goal received mounting criticism for being unachievable and unaffordable in any realistic timeline, even as the Navy’s top officer espoused the need to build those greater capabilities in the next decade. At his own confirmation hearing, Trump’s Secretary of the Navy tacitly admitted the 350-ship fleet might never be reached. Nevertheless, while the “Sustainable Growth” plan appears to be the most likely and most achievable plan, a 355-ship fleet isn’t what the U.S. Navy anticipates it will need in the 2050s, but what it assesses it needs to meet its mission requirements today. So in anticipation of either more a more permissive fiscal environment, or a clearer strategic threat from China or Russia to motivate Congress, the Navy included an “Accelerated Growth” plan to build the fleet up to the shipbuilding industry’s maximum achievable capacity. If fully funded, this plan could deliver a 355-ship fleet in the 2030s instead of the 2050s. As a bridge to a larger fleet the Navy is looking at aggressive service-life extension programs, modernizations and repairs designed to add five to ten extra years to aging ships before they must be retired. The Navy’s proposed 2019 budget includes service life extensions for four mine-hunting ships, in part a recognition of continued delays to deploying of a mine-hunting capability on the Littoral Combat Ship. One Los Angeles-class attack submarine is also funded for life-extension, with four more candidates identified for future life extensions. This could be a crucial bridge for the submarine fleet, which is facing the largest shortfall between the number of required hulls and the expected size of the fleet due to the complexity of quickly increasing the capacity of shipyards to build them more quickly. Submarines are also among the highest-demand platforms in the U.S. fleet. The head of U.S. Pacific Command says attack submarines are the United States’ most important advantage over growing great power threats from China, but the current fleet is only able to meet half his needs. While this plan shows the U.S. fleet is on track to get much bigger in the coming years (even if at a much slower rate than many experts advocate), it doesn’t appear that the existing fleet will be seeing much relief from the increasing tempo of operations it has been working at. For the past two decades, the U.S. Navy has maintained an average of 100 ships deployed world-wide at any given moment. But over that same time period, the U.S. fleet shrank from 336 ships in 1999, to a low of 271 in 2015, with the increased demand on a dwindling number of ships contributing to many of the readiness and maintenance problems the U.S. Navy is experiencing today. Both analysts and Navy leaders have said that the only way to fix the fleet’s readiness issues, exemplified for many by the string of deadly mishaps in the Pacific fleet last year, is by increasing the size of the fleet to relieve the pressure of deployment requirements and create the time and space for additional training and maintenance. The recently departed head of the U.S. surface fleet said that to heal the fleet needed both fewer mission requirements and more ships. However, using additional new hulls to relieve pressure on the fleet overall doesn’t appear to be the Navy’s plan. By the end of 2023, the Navy expects to reach those late-90s levels again with a planned 326 ships. But according to its 2019 budget request, instead of using those additional hulls to relieve the deployment demands on the fleet as a whole, the Navy plans on deploying a third more of them, for an average 131 deployed during 2023. If the operational requirements on the Navy’s surface fleet are not going to be appreciably reduced as the number of ships grows again, it remains to be seen if other institutional and training reforms will successfully make up the gaps in readiness that became obvious when the USS Fitzgerald and USS John S. McCain lost 17 sailors in collisions last summer.